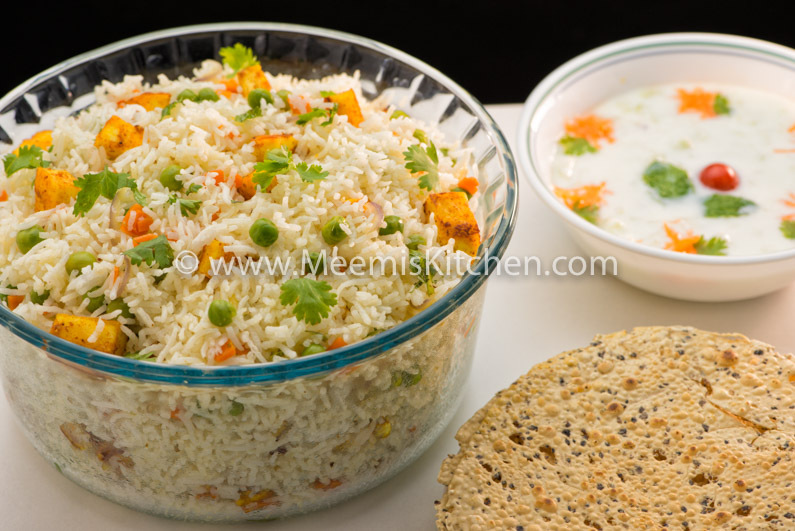 Paneer Pulao, Simple Paneer Pulav, is a tasty Indian Pulao, a mildly spiced rice dish with Paneer cubes and vegetables. It is a great Lunch Box idea as well; Paneer Pulao with simple cucumber Raita and Papad makes a hearty lunch. Furthermore, it is very easy to prepare with simple ingredients. 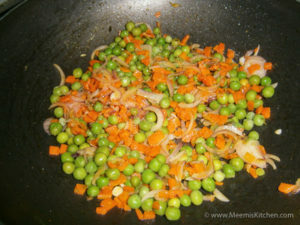 Paneer, Peas and carrot make a great, colourful, tasty combination and adds to the appeal. If you are looking for healthy rice dishes for lunch Box that are tasty, simple and easy to prepare, check my Paneer and Tomato Pulao, Vegetable fried rice, Chilli Garlic fried rice, Corn Pulao, vegetable Pulao and Tomato rice with coconut milk. Paneer Pulao is also very tasty and ids would love the shallow fried Paneer cubes and the mildly spiced Pulao. This Paneer Pulao is a great dinner option too; just pair it with some rich gravy like Kashmiri Mutton Curry, Punjabi Chicken curry, Prawns in Coconut Milk, Kadai Chicken or Pepper chicken, Butter Chicken, Rajma Masala, Paneer dishes or semi gravy dishes like aloo simla mirch recipe, Peshawari chicken curry etc. and serve your guests. Like Biryani, Paneer pulao is a wholesome dish. If you like Biryani, check my special Thalassery Mutton Biriyani, Thalassery Chicken Biriyani, Ghee rice or Quick Chicken Biriyani. Basmati Rice, Pulao Rice or Jeera rice are best suited for this Paneer Pulao. Always use good quality Paneer or homemade Paneer. 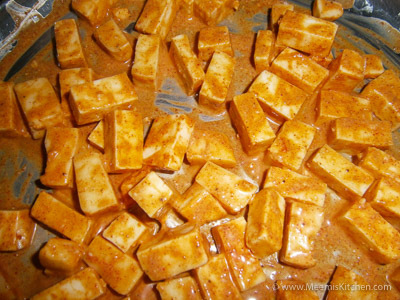 Paneer should be slightly toasted with mild spices. 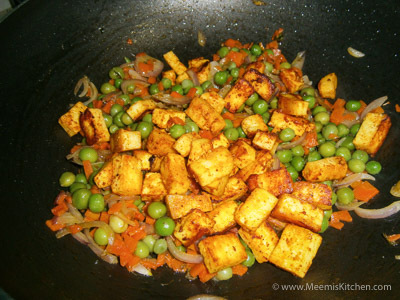 If the Paneer is over cooked it might turn rubberish. Add some fried onions and cashews to garnish during special dinner occasions and spice up the appeal! So, here is the recipe for delicious, simple Paneer Pulao in easy steps. Green chillies : 3 nos. Mint leaves + Coriander : little for Garnish. Wash and soak rice in water for 20 – 25 minutes. Drain and keep aside. Heat oil/ ghee in a thick bottom pan and add Bay leaf, Cardamom, cloves and cinnamon sticks. 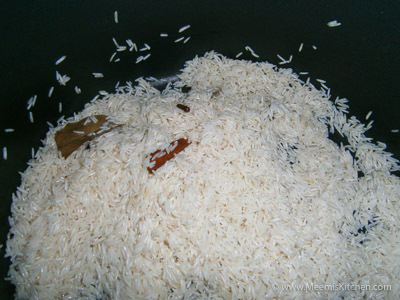 Mix the drained rice and fry for few minutes. Add double measure hot water, enough salt and lime juice and cook till done. Keep it aside for cooling. Cut the Paneer into small cubes and marinate with curd, chili, turmeric, pepper, Garam Masala powders and salt. Shallow fry/ toast slightly in ghee and keep aside. Slice the onions, crush green chillies. 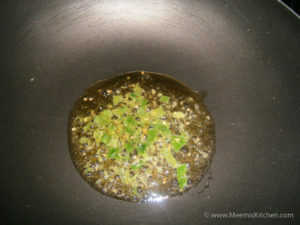 Heat oil and ghee, fry the crushed green chilies, then Ginger Garlic paste. 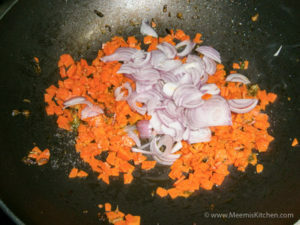 Then fry chopped carrots and onions. Add cooked green peas and roast for some time. 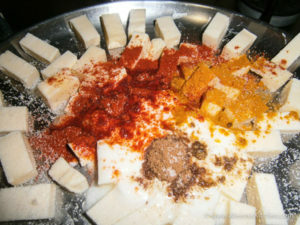 Add the Paneer cubes and adjust the salt. Mix with the rice gently. Garnish with chopped coriander and mint leaves, fried onion, cashews etc and serve with raita, pappad and pickle. Rice can be Jeerakashala or Basmati. 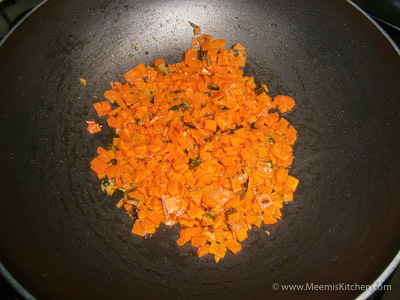 Soak for 20 minutes and fry nicely in little ghee. Lime juice is added to avoid the sticking of rice. Adjust the salt before adding rice, it should be little in excess so the rice will have enough salt. You can cook the rice earlier and do the rest later, to adjust/ save time. If you found this recipe tasty and useful, please let me know or share it with your friends. It will keep me motivated. Thank you, God Bless! !